Chevron stripes are the new rave! 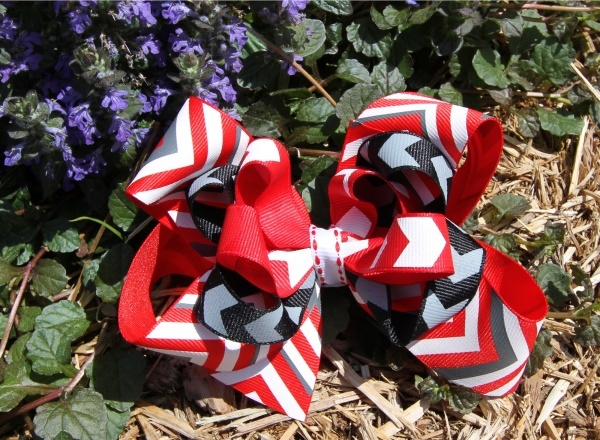 This bow is a triple threat bow for all of our Chevron stripe lovers! The bottom layer is a 1.5" red chevron with red and white stripes. In the middle is a 5/8" black chevron bow with black and gray stripes, topped off by a red chevron bow with red and white stripes. All wrapped together by a white with red lines 3/8" ribbon in the middle and attached to a French clip. This red chevron will look great will all your new Chevron outfits.